Defron is an English-Australian rapper and writer from Melbourne, Australia. He is the 2009 Revolver MC Battle Champion and 2013 & 2017 Victorian State Finalist in the Australian Poetry Slam. A hip-hop facilitator for over 10 years, Defron runs the hip-hop & electronic department of The Push and also delivers hip-hop/rap workshops in a freelance capacity. Beginning his career as a freestyle and battle emcee, from 2009 to 2012 Defron faced international battle-rap veterans illmaculate, The Saurus, Real Deal and Madness as well as competing alongside Australian hip-hop royalty including Allday, Kerser and Manaz Ill. In 2015 Defron released his debut EP 'Invalid' to glowing praise on Tone Deaf, The Music.com.au and Beat as well as radio-play on Triple J, Triple R, FBI, PBS and Syn FM. A stalwart of Melbourne hip-hop, Defron has performed in his city’s most esteemed venues including Workers Club, The Espy and Max Watts, sharing the stage with the likes of Odd Future, 360, Mantra, Illy, Seth Sentry, Pez and Akil of Jurassic 5. His debut mixtape 'Maybe You’ll Be Famous When You’re Dead' produced by Entelechy is due for release in late 2018. 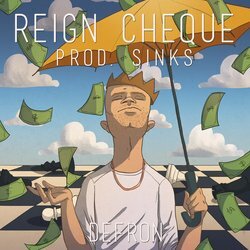 Produced by fellow Melbourne hip-hop artist Sinks (Echo Drama/2017 Hilltop Hoods Initiative Recipient) with artwork by frequent collaborator Katie Alexander, Reign Cheque is a boom-bap theme-song for getting up, getting out and achieving your dreams. The promotional single is the first of two ahead of the release of 'Maybe You’ll Be Famous When You’re Dead', due late 2018.